In a country divided by factions after the English Civil War the desires of the most powerful players are deadlier for being concealed. Meanwhile, amongst the danger and mystery moves the King’s Shadow, the most enigmatic of them all. Until New Year’s Day 1660, few believe the return from exile of the man who would become Charles II ever will happen. But on this icy morning, an army sets out from Coldstream to march on London. Is it marching to bring back the king? Mark Denton, colonel of cavalry, is the most rigorous parliamentarian in York and the scourge of royalist conspirators across the North. He must find out what his commander, General George Monck, intends to achieve in London. Lucinda Selby’s family has been dispossessed by England’s new rulers of their land and home in the Yorkshire Dales – and it is now in the hands of the despised Colonel Denton. Lucinda, in secret revolt against Parliament and its army, allies herself with a brilliant member of the exiled court and goes to London also – with a risky mission on the king’s behalf. I received The King's Shadow as an ARC from the author. The book is the third in a trilogy; however, you do not need to have read the others first as this story also works well as a standalone title. I have not read the previous two, and I still found The King's Shadow immensely enjoyable. The main characters caught my interest right from the start. I guessed the identity of the King's Shadow early on, but that did not ruin my experience reading the book as it was fun to watch and wait for the other characters to realise the truth. The prose was well written, the action moved at a good pace throughout, and I was always keen to turn the page and find out what would happen next. In truth, the 17th century in England is a period with which I am not overly familiar. I like the 16th century, and the 18th and early 19th centuries are periods I adore and in which I am extremely well read. 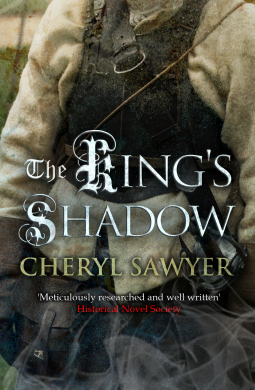 For some reason, I've always jumped over the Civil War era, but reading Cheryl Sawyer's novel makes me think I ought to remedy that. I see some non-fiction reading on the horizon, and I also plan to check out the earlier two books in this trilogy when I get the chance.